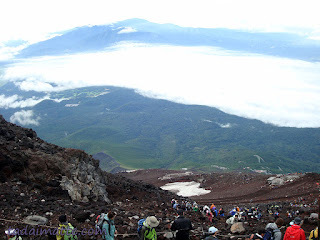 This is the third in a series of posts about Mount Fuji. 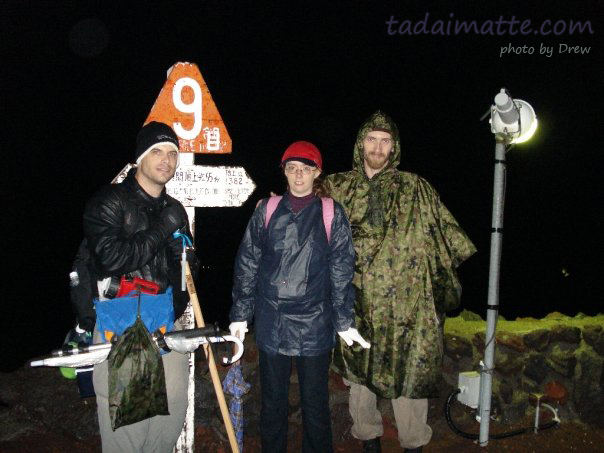 We were back in Tokyo and barely 24 hours recovered from the first disaster when I started looking up information about Mount Fuji - I really wanted to know how close we'd gotten to the top. The knowledge that we were barely 400 metres away, though, didn't sit well with either Drew or myself. On the very site that I'd used to get the bus schedules to Kawaguchiko, I discovered that we'd broken just about every rule in the book. Mt. Fuji is the highest mountain in Japan. Please climb with enough care. Make sure to check the weather forecast in advance, and bring proper clothing to protect from rain and cold.Snacks are also helpful. We brought snacks and assumed the weather would be gorgeous. 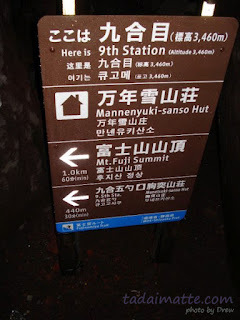 To prevent altitude sickness, you should stay at the 5th station for a while to acclimatize yourself to the high altitude before you start climbing. Nope. The atmospheric pressure of Mt. Fuji is approximately two-thirds of the ground. Ascend as slowly as possible. You may suffer from altitude sickness if you climb quickly. OH MAN SUNRISE IN AN HOUR QUICK CAN WE GET TO THE TOP FROM HERE IN AN HOUR!? Climb at your own pace depending on your physical strength and condition.Drew pace. (You may get tired if you try to keep up with others or rest too long.) Gwen, at least, followed this advice...and so we left her at the sixth station. Use only the official routes. Yay, we did this! Take a break if you feel tired. You should also drink water alcohol or have snacks to replace lost salt and sugar. We had a handful of gummy candy. If you feel ill, give up your climbing and descend the mountain as soon as possible. Ash: "I feel sick to my stomach." Drew: "Oh. Can you make it to the next station?" When climbing in a group, be sure to agree on the meeting place. Wait for others if you arrive at the place first. "If we make it to the summit we'll wait for you there. Or meet you on the way back. Hey, my cell phone doesn't work so great up here, huh?" The temperature drops about 0.6 degrees Celsius (33.08 degrees Fahrenheit) for every 100 m (328 ft) of ascending. The weather is very changeable, too. Bring rain gear, warm clothing, and spare clothes. AHAHAHAHAHAAA. HA.....ha. If thunder approaches and you feel dangerous, take refuge in the nearest mountain hut. We lucked out. There was no thunder. When climbing in a group, you have a chance of being separated. Try not to lose sight of your companions. Did we mention that we left our companions behind, halfway up the mountain? If you climb at night, you should have a flashlight or a headlight. WE ARE SO STUPID. OH GOD. Mountain huts are not open for 24 hours. This would have been useful to know beforehand. Toilets in the huts and on the summit may be out of service due to overuse or weather conditions. They worked. Whew. The signposts on each trail are classified by color. When descending, check the color to take the correct trail. ...is THAT why they were coloured? Travelers checks and credit cards are not accepted at mountain huts. Bring enough cash to cover the expenses of food, lodging, toilets, etc. "Drew, can I borrow 2,000 yen to buy this raincoat?" You are not allowed to pitch a tent on the mountain. It is extremely dangerous to sleep outside, too. Always use the mountain huts for sleeping. Guess it's a good thing we didn't actually make it to the summit, because this was the grand plan. Dishevelled and disappointed, sitting in our Ikebukuro hotel room, Drew and I mourned lost opportunity. Even though we'd screwed it up six ways from Sunday, with our umbrellas and our Chu-Hi and the hurricane flashlight, we'd still been so close. Drew lamented that fact that he'd never get the chance to try again - or at least, I'd never agree to try it again. I still had the website open. "Well, it looks like it'd be a lot easier if we approached it from the Shizuoka side...we're free Tuesday and Wednesday, right?" And this was how we came to attempt to defy destiny. Take two. Gwen is represented by my cell phone. 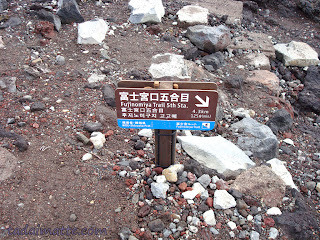 They say a wise man climbs Fuji once, but only a fool climbs Fuji twice. Does it count if we only climbed it one-and-a-half times? Fuji II: Electric Boogaloo took place a week or so later, after we'd all four of us returned to Osaka and set up camp in my tiny apartment. Technically, we were five by that point, as my friend Jenna had come from Canada the day we were setting out for the mountain. This time, we were determined to do it right - the boys had gone shopping for flashlights and ponchos while I was at work, and Gwen decided to sit out Version II and keep Jenna company back at my place. Unfortunately for me, when I asked the boys where my flashlight and poncho were, they had thought I had something at the apartment. 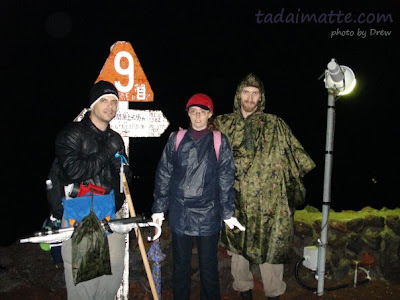 (My previous ripped and destroyed Fuji rain pants had been thrown out before we even left the mountain.) I took the kitchen flashlight and a raincoat, and hoped for the best. Except....that was what got us in trouble the first time. You could not possibly say that there was a lack of planning on the day of our second undertaking. Unfortunately, we had a late start after I picked up Jenna at 6:30 A.M. from Itami Airport, and 5 people in my room wasn't helping anyone get going faster. I had to bike to school and return a key I'd accidentally pocketed the day before. Drew had to be in Tokyo the following day to fly back to Canada, so we had all of his luggage to carry, and thus it was past two by the time we made it to the train station and boarded a shinkansen out of Kyoto. The Japan Railways employee assured me, "The next Hikari train stops in Shizuoka." 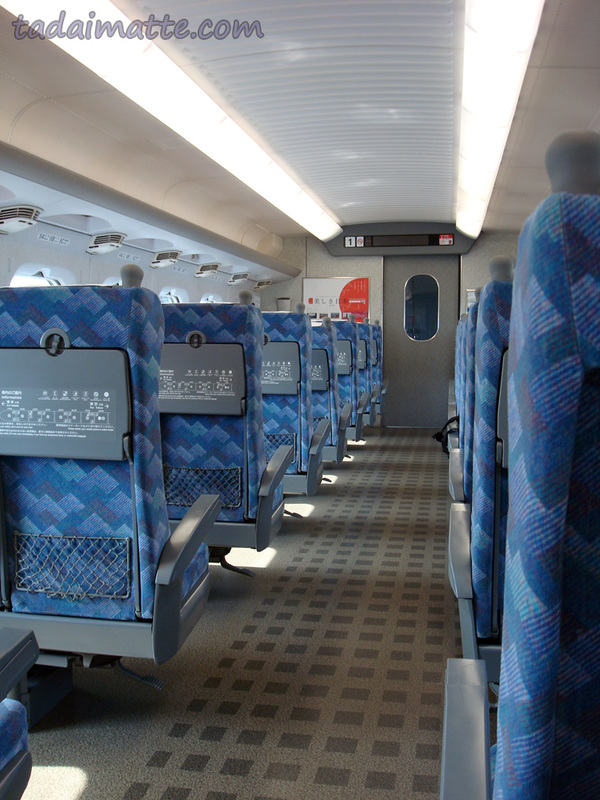 Hikari is the second-fastest train on the Tokaido shinkansen (the bullet train line that runs from Osaka to Tokyo). However, we didn't make that very next train, and it turns out that not every Hikari train makes the Shizuoka stop. Imagine my horror when the announcer informed us, after leaving Nagoya, "The next stop will be Odawara." We overshot Shizuoka by about 100 km. Hopping off at Odawara, we took a Kodama (the slowest shinkansen, almost like a local train) back, and even had to sprint to make the train, which only came once every 30 minutes. Our Kodama sat at Mishima station for five minutes while we impatiently checked our watches. Using my cellphone to Google it, I commented that there was a bus from Mishima if we wanted to just get off here and go. 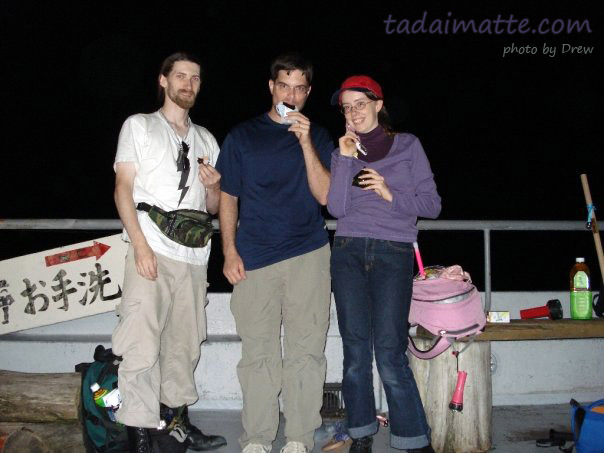 However, we thought Mishima wouldn't have big coin lockers to store Drew's luggage, so we continued on to Shizuoka...to discover that there were only two buses per day from there to the mountain, and we had already missed both. Panicking, I checked Google again and found that we were about to miss the buses from Mishima and Fuji/Shin-Fuji as well. There was a slight hope we might make it, so I had to make a judgement call; Shin-Fuji or Fuji? Fuji was a local station, not a shinkansen (therefore cheaper - bullet train rides cost a pretty penny) and the bus passed by there after leaving Shin-Fuji Station, so that was how it'd be. We got on the train and I immediately dialed Gwen to ask for help. Emily was upstairs in my apartment with Gwen, and the two of them together consulted the bus timetables...but we were going to miss the last bus. Again. Em suggested an alternate route using limited express trains to Fujinomiya Station and then a bus from there, but that, too, we would miss by five minutes. We kept missing things by five or ten minutes!! Using my phone again, I figured out that it ought to be less than ¥10,000 to get a taxi from Fujinomiya to the fifth station of the mountain. (Deja vu, anyone?) So we decided to get the local Minobu Line train there and then cab it. It was dark by the time we arrived at Fujinomiya. Still trying not to repeat any more of our mistakes, we went to a 7-11 to buy snacks and walking sticks, then returned to the station and got a cab. The cab driver laughed when we told him where we wanted to go. We assumed that he was just laughing over foreigners climbing Fuji from the Shizuoka side of the mountain, or perhaps it was rare to see people trying to access the mountain from that particular station. It wasn't until we were in the cab and driving up the mountain and we passed a local city bus coming down, that we realized he had laughed at us for taking a taxi instead of the bus. Fifth Station - 2400 metres. Bottom of the mountain, around nine P.M. - we bought postcards at the shop (things were actually open in the night-time on this side) and had a last snack of rice balls and boiled eggs before starting our climb. The weather was very favourable. We called Gwen, took a commemorative photo and set off up the mountain! Sixth Station - 2490 metres. This station was closeby and easy. The others were moving a bit fast so I had to stop and rest, air out my boots before continuing. I had cleverly worn boots instead of sneakers this time. We frequently stopped to snack on jerky and look at the flawless sky. There was a full moon. We marvelled at how well things were going. Hahaha. (Old) Seventh Station - 3010 metres. We made it past the New Seventh and then the Old Seventh station, and we were starting to wear down a bit, but were still lively. The guys complained that I'd insisted on bringing the umbrellas we had been given by the taxi driver on our first attempt. I had no snaps on my backpack, so Drew and Alec were stuck carrying them. Well, I was pretty happy to have the umbrellas when, soon after leaving the seventh station, the sky opened up and it began to pour. I guess I didn't learn my lesson about rain gear well enough, as I had that rain jacket, but no rain pants. Drew's poncho dripped water all down his side. Holding the umbrella aloft, I had to practically run to the next station, and, once there, we'd actually lost Alec. Eighth Station - 3250 metres. I had to buy another rain suit here, and proceeded to put it on under my clothes this time (between my second set of dry longjohns and my soaked jeans), then ditched the torn coat and suited up in the new one. Alec and I also had to buy dry socks. I got a rice ball to keep my energy up, since we couldn't stop leisurely anymore. This done, we set out again, but with our spirits as damp as our clothes. The rain persisted awhile longer. I hate everything right now. So close, we could taste it. 1 km away. 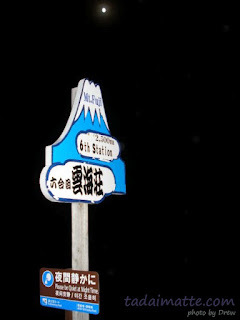 Ninth Station - 3460 metres. Eventually, it did stop, but that was as we approached the ninth station and the sun began to break through the clouds...and so did the people who had stayed the night in huts, emerging and ready to make their final ascent! There was actually a LINEUP to climb the path! Drew and I bypassed people, occasionally climbing outside the trail, but Alec wasn't up to it. There were people bottlenecked almost all the way back to the ninth station! Everyone had spent the night at 9 or 9.5 with the intention of heading out just before dawn. The trail was narrow and steep, and no matter how many times we dodged the crowd by walking outside the ropes, we inevitably got caught up behind another group of climbers. Alec was starting to get altitude sickness (Floridians!) and his pace had slowed significantly. Finally, we realized that dawn was about to break and no way would all of us get there to see it at the rate we were going. We insisted that Drew go on ahead alone to see his sunrise, and Alec and I would follow when we could. Ninth and a Half Station - 3590 metres. 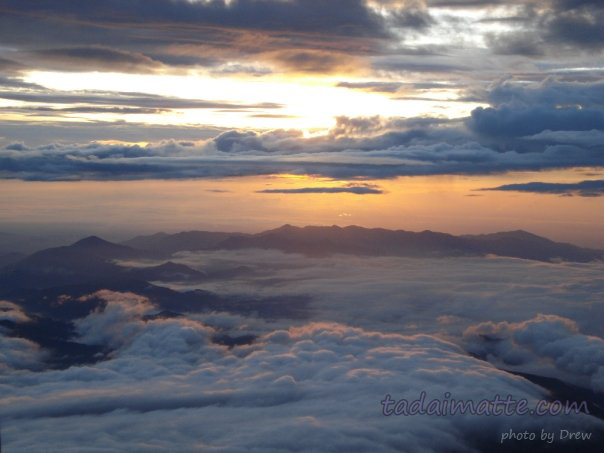 I kept encouraging Alec and pushing until we'd gotten past Station 9.5, but the sun was rising just then, so twenty metres from the top as he was still dying at my pace I finally had to say "Take a breather, I'll meet you up there," and hurried ahead to see what sunrise I could. I found Drew pretty quickly at the top and set up a small camp for our celebration, changed into the winter coat I'd borrowed from Gwen and tucked my freezing legs under a blanket to rest them, but when Drew reported back from finding Alec - who had trailed up some ten minutes after I had - it seemed he was feeling awful and had holed up in the rest area. We joined him there; Drew and I toasted our victory and we started scribbling out postcards to mail from the tiny post office. Alec had altitude sickness for sure. Once we had written and stamped our cards, the boys went ahead, knowing that Alec would need as much time as possible to get back down, and Drew needed to catch the 9:30 bus in order to reach Narita Airport at a respectable time. It was past six in the morning at this point. I stayed at the summit by myself for another 20 minutes or so, taking photos and posting the postcards before hustling down and catching up to the others not far from 9.5. It's all downhill from here. Literally. The trek down may have been worse than up. The rain was difficult to climb through, for sure, but the trail was just gruelling with people climbing in both directions on the narrow paths. A short-cut ended up taking us much longer than we anticipated. Not far past the eighth station, we realized that Drew was not going to make his 9:30 bus, or even the 10:30 bus, at the rate we were going. He didn't want to separate, especially with Alec still nauseous, but we had no choice. Drew wasn't certain about getting back to Shizuoka and then on the right train to Tokyo on his own, so he and I went on ahead at a much faster pace, and Alec agreed to call me from the shinkansen station when he got there. To this day, this was the last time Drew ever saw Alec. We hustled, but I couldn't keep up with Drew, and the two of us also split up not too far past the Old Seventh Station. He lost me so thoroughly that even at a flat-out run between Six and Five, I didn't catch up to him at any point. We finally met again at 10:40 at the bottom of the mountain - he had missed the 10:30 bus. The only choice we had now was the 11:30 bus to Shin-Fuji, putting him on a shinkansen there and abandoning the luggage. For a 5 o'clock flight, there was no hope of getting back to Shizuoka to get his suitcase; he would be lucky to arrive at Shinagawa Station with enough time to make the Narita Express. Trouping back down. At high speed. At Shin-Fuji we bought tickets for Drew on the next Hikari train, and I took all the things in his bag that could not be taken on the plane, and sent him off to Tokyo on his own. Two hours later, in Shizuoka, Alec was sporting an angry sunburn similar to the one I was starting to feel. We hadn't thought at all about the blazing sun on the way down. Getting Drew's bags out of the locker, we were able to walk about ten metres with them...and then Alec said "OK, forget this. We'll never make it home with this stuff. Where's a convenience store?" We mailed the suitcases back to Osaka from the 7-11. Now that the suitcases had been handed off to the poor girl in the 7-11 and it was just us and the backpacks that we'd already been carrying for 24 hours straight, we tried to take a local train home to save money, but delay after delay after delay happened. We ended up taking a shinkansen from Nagoya rather than suffer another three hours. Missed the train in Kyoto by fifteen seconds, and then missed the Keihan train, too. At Tambabashi, the rapid trains spontaeneously shut down! So we had to take a local all the way home, starving and sunburnt and tired and angry. We had left the mountaintop fourteen hours prior - it had taken us even longer to climb down and come home than it had taken to get there and ascend in the first place. We couldn't even congratulate ourselves on a job well done. On the way back through the train mess, I called Pizza Hut from one of the stations and ordered a pizza to make up for the hellish day. We were three stations away from my apartment. The pizza still got there before we did. 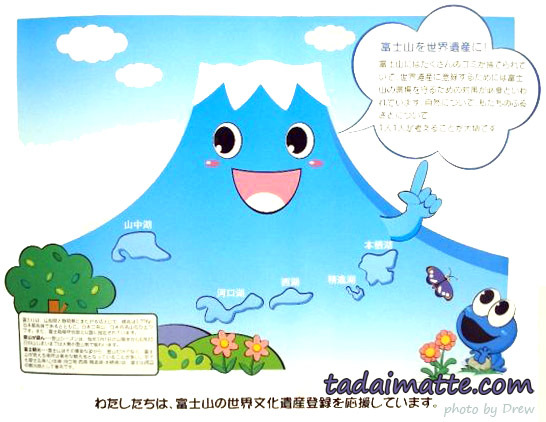 Mount Fuji - it contaminates everything it touches.